We’ve reached that time of year where everyone in the security industry is pulling together predictions for what we expect to see over the next year, and/or slowly backing away from any imperfect predictions we might have put forth the year before. 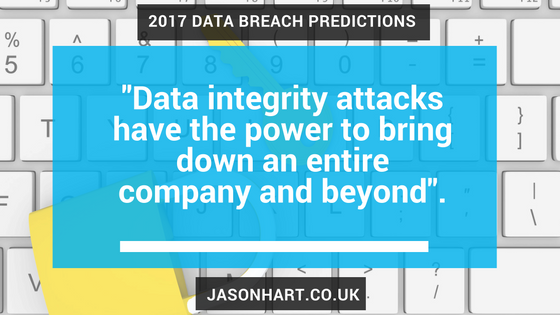 Last year, I offered up a number of predictions, but the one continuing to make huge waves in 2017 is around data integrity attacks. Quite simply, I expect that we’ll see more intricate, complex and undetected data integrity attacks and for two main reasons: financial gain and/or political manipulation. Data integrity attacks are, of course, not entirely new. Data integrity is a promise or assurance that information can be accessed or modified only by authorised users. Data integrity attacks compromise that promise with the aim of gaining unauthorised access to modify data for a number of ulterior motives. It is the ultimate weaponisation of data. Fast forward to 2015 when Anonymous began releasing financial reports exposing firms in the U.S. and China trying to cheat the stock market, in one case, damaging the brand reputation of REXLot Holdings, a games developer that had inflated its revenues. The same year, there was the JP Morgan Chase breach and subsequent attempt at market manipulation. Which leads us, of course, to 2016, with the World Anti-Doping Agency and Democratic National Committee breaches, both examples of how hackers are using data integrity attacks to embarrass organisations. How will cyber attacks get worse? What’s different now from last year’s prediction? Why will these attacks get worse? The first generation of cyber attacks were about cutting access to data, and then we moved on to data theft. Now, we’re starting to see evidence of that stolen data being altered before transition from one machine to another, effecting all elements of operations. Today’s connected world constantly generates mounds of data that businesses, industry pros and analysts use to drive decisions, make projections, issue forecasts and more. Data integrity attacks have the power to bring down an entire company and beyond. Entire stock markets could be poisoned and collapsed by faulty data. The power grid and other IoT systems from traffic lights to the water supply could be severely disrupted if the data they run on were to be altered. And perhaps the greatest danger is that many of these could go undetected for years before the true damage reveals itself. What’s at stake is trust. Decision-making by senior government officials, corporate executives, investors and average consumers will be impacted if they cannot trust the information they receive. At this point, you’re probably terrified—or morbidly depressed. Is there anything we can do? And the answer to that is yes. When I talk to the businesses we work with, one of the first questions I ask is, “What are you trying to protect?” If you don’t know what data you’re trying to protect, there is no point in spending money to protect it. It’s a straightforward enough question perhaps, but it isn’t very easy to answer. Despite this, working out an answer is one of the most fundamental things an organisation can do towards making itself secure. Last month’s blog, Securing the breach trumps breach prevention, detailed some additional tangible steps you can take. Breaches will continue to happen—to expect otherwise would be unrealistic. But as their scale and complexity grows, focusing on them first would take up all of an organisation’s IT security bandwidth. A better starting point is to know what you are trying to protect. This blog post also appears here in my regular blog for Network World. Data breaches aren’t going away, and the costs of a breach are becoming more tangible. By implementing a three-step approach, organizations can prepare for a data breach. How do you manage encryption and where are your keys? Since keys are being stored in a variety of places, often on the very systems containing sensitive data, they are vulnerable to theft and misuse. Backed up keys are also not being secured while in transit, leaving another area of exposure. Restricting access to these cryptographic keys is also a best practice. It’s also critical to ensure no single user has rights to everything. Summer 2016 was not a good time for data breaches. First, news broke that the Democratic National Committee was hacked, leading to the resignation of DNC Chair Debbie Wasserman Schultz and driving a wedge between Democratic Party members. Later, the World Anti-Doping Agency (WADA) announced that Russian hackers had illegally accessed its Anti-Doping Administration and Management System (ADAMS) database, leaking confidential medical information for U.S. athletes, including Simone Biles and Serena Williams. Then earlier this month, passwords, usernames, email addresses and other personal information was published for more than 2.2 million people who created accounts with ClixSense, a site that pays users for completing online surveys and viewing advertisements. These were not the only breaches of the summer, nor were they the largest. However, each is a clear example of the changing face of data breaches and the rise of identity theft. According to Gemalto’s Breach Level Index, for the first six months of 2016, identity theft was the leading type of data breach, accounting for 64 percent of all data breaches, up from 53 percent in the previous six months. Malicious outsiders were the leading source of data breaches, accounting for 69 percent of breaches, up from 56 percent in the previous six months. What we have been seeing over the past two years is that data breaches have shifted from stolen credit card data and financial information to the theft of something much more intimate—identities. As a result, data breaches are becoming much more personal and the universe of risk exposure for people is widening. In the case of the DNC and WADA breaches, sensitive data was leaked to publicly smear people. Contrast that with the IRS data breach involving more than 700,000 stolen Social Security numbers that resulted in thousands of false tax returns being filed. As companies, governments and other organizations collect ever-increasing amounts of customer information and as our online digital activities become more diverse and prolific, more data about what we do, who we are and what we like is at risk to be stolen from the companies that store our data. So, why isn’t anyone paying attention? The truth is that despite today’s daily headlines about data breaches, the problem with cybersecurity is that there’s a lot of apathy regarding the issues. Consumers know their credit cards will be replaced and they will not be responsible for financial losses. Breached companies know their stock prices will rebound eventually, and government regulations are simply not a good prescription for security. At this point the daily noise around data breaches is making it more difficult for consumers, government regulatory agencies and companies to distinguish between nuisance data breaches and truly impactful mega breaches. News reports fail to make these distinctions, but they are important to understand because each has different consequences. A breach involving 100 million user names is not as severe as a breach of 1 million accounts with Social Security numbers and other personally identifiable information that are used for financial gain. At the end of the day, the best way to protect data is to kill it. That means ensuring sensitive data is protected with encryption so it is useless to the thieves. In this post I stressed the need for organizations to create a “Secure Breach” environment to safeguard data. In this increasingly digital world where greater and greater amounts of data are being stored, managed and shared via the cloud and multiple (and unsecured) devices, it is clear that data breaches are going to happen. That is why companies need to shift from a total reliance on breach prevention to strategies that help them secure the breach once intruders get past network defenses. That is why more focus needs to be on understanding what really constitutes sensitive data and where it is stored, and using the best means to defend it. At the end of the day, the best way to protect data is to kill it. That means ensuring sensitive data is protected with encryption so it is useless to the thieves. Even though encryption is widely known, less than 4 percent of all data breaches this year involved data that was encrypted in part or in full, according to the Breach Level Index. This number has stayed more or less the same for the past several years, and that’s unacceptable. While credit cards can be easily replaced and fraudulent charges covered, the damage from stolen identities and sensitive personal information is much longer lasting. So, what will that be the tipping point that moves companies to adopt a secure breach strategy? In my next blog, I’ll present some strategies for how companies can better defend data and secure the breach. In the meantime, let me know your thoughts in the comments. Despite increasing data breaches (a whopping 4.7 billion data records worldwide being lost or stolen since 2013) and mounting regulatory and customer pressures around data protection, IT decision makers worldwide continue to ignore reality and rely on the same breach prevention strategies when it comes to protecting customer data and information. Today’s IT security professional clearly has a “reality distortion field” when it comes to the effectiveness of perimeter security. According to a recent survey of IT decision makers worldwide, one-third of organizations experienced a data breach in the past 12 months. Yet, while 86 percent of organizations have increased perimeter security spending, 69 percent are not confident their data would be secure if perimeter defenses were breached. This is up from 66 percent in 2015 and 59 percent in 2014. Furthermore, 66 percent believe unauthorized users can access their network, and nearly two in five (16 percent) said unauthorized users could access their entire network. Reality distortion field is a term used to describe the belief that wanting and willing something—even the near-impossible—can make it happen. The term found its inspiration in a two-part episode of Star Trek that aired in 1966, where inhabitants of the planet Talos are able to create new worlds and thoughts in the minds of other people. We need to be able to see through cybersecurity’s reality distortion field and place our bets on strategies that align to the problems we face today. According to pop culture legend, Bud Tribble, a software developer on the original Macintosh computer, used the term to describe Steve Jobs, noting, “In [Jobs’s] presence, reality is malleable. He can convince anyone of practically anything. It wears off when he’s not around, but it makes it hard to have realistic schedules.” Charismatic SpaceX and Tesla CEO Elon Musk has also been described as having a reality distortion field. Jobs and Musk’s contributions to technology advancement are legend because of their ability to push people past their own perceptions of reality. However, a reality distortion field has overtaken today’s data security mindset when it comes to the effectiveness of perimeter security. IT budgets summarize today’s reality in security: perimeter security is consuming an ever-larger share of total IT security spending, but security effectiveness against the data-breach epidemic is not improving at all. Organizations are not investing in security based on reality as it is; they’re investing based on reality as they want it to be. The problem and the solution to the problem just don’t match up. To be clear, organizations should not stop investing in key breach prevention tools. However, we need to be able to see through cybersecurity’s reality distortion field and place our bets on strategies that align to the problems we face today. Look at it this way: If it’s impossible to keep intruders out of the network, the logical approach is to build security around the assumption that they are already on the inside. When you do this, you focus on what matters: securing your data. It then becomes clear that you need to move your security controls as close as possible to the data so attackers can’t use it, even if they have breached the perimeter. In effect, you need to create a “Secure Breach” environment. Technical specifications will vary depending on IT infrastructure, but with this blog, I hope to highlight the questions organizations need to ask to adjust their security strategies appropriately and how they can realign their investments and tactics to better emphasize data security. Watch this space! ( This post was also published on Network World). Earlier in the year, we asked young people from all over the world what they thought the future connected society might look like – and in particular, how they envision the future of cybersecurity. As expected, fingerprints and iris scanning were popular, as were voice biometrics and facial recognition. But it was the 30% who thought our DNA could be used to unlock our phones that got us really thinking about what the future of digital security could hold. DNA cryptography is a fascinating and fledgling field where ideas are only just being put into practice. The hope is that you can store vast amounts of data within DNA. A gram of DNA is the equivalent to 108 terabytes of data. So if you could hide data within the DNA, and then encrypt it, you could open up the possibility of a near impregnable security process. But moving closer to reality, if there is one thing that consumers hate right now it’s trying to come up with, and remember, a secure password. We’ve covered this on the blog a number of times, and even have developed a guide for you to use. But frankly, we’re getting to the point that with so many websites and services needing a password, you’re likely better off with a password manager. But what if that was hacked?! For some, the death of the password can’t come soon enough, but there are other ways to authenticate your identity which are vying to gain traction and acceptance. Fingerprints – the classic identifier that you probably use to unlock your phone. Likely to become more widespread. Heartbeat – like fingerprints, no two beats are the same, and startup Nymialready has a product that’s shipped. Your walk, your nose, and even your ear – slightly more intimate! Of course, the future of cybersecurity will continue to include multi-factor authentication, so companies are looking at ways to fundamentally alter how you log into their services. Google has just announced its Trust API. This platform is in early testing, but it hopes to put various indicators together to confidently predict whether the person logging into a service is the legitimate user. These indicators could include your location, biometric information such as your face or voice, and even behavioral traits such as how you move, type and swipe the screen. The results would then be tallied up to give you a trust score which, if high enough, would let you automatically log into the service you want to use. For companies, they are always thinking about the future of enterprise cybersecurity too. We recently covered how Google has done away with perimeter security and BYOD, accepting that perimeter breaches are inevitable. Their focus instead is protecting applications and the data they access. The erosion in the faith of the perimeter to safely protect corporations will shift thinking to how you can secure data at a deeper level. This approach could certainly figure in the future plans of corporations that can’t afford another hack. It appears that the future of cybersecurity for consumers lies in a combination of biometric data and behavioral analytics (but be cognizant of the risks! ), and a concentrated focus on encryption by enterprises to secure sensitive data. What’s certain is that in the future, we’re going to have to very careful with how we store, move, and access data. Hacking is getting easier and cheaper, so every enterprise should do it. Wait… what? Of course, I’m talking about reaping the benefits of ethical hacking as a way of preparing for an actual cyber attack – the odds of which are increasing as hacking services become simpler to obtain. Just about anything can be bought in the Internet these days, legal or otherwise. Rocket launchers, hard drugs and indeed hacking services have become as easy to purchase as books and music. While some such services are available on the regular Web, more serious customers turn to the TOR, The Onion Network. Also known as the Dark Web, TOR enables buyers and sellers to transact with full anonymity using cryptocurrencies such as BitCoin. Through TOR, hacking services have proliferated in recent years. They’ve been used by individuals with an axe to grind, such as Edwin Vargas, an NYPD detective. Driven by jealousy he paid $4000 dollars for over 40 email passwords, half of which belonged to police officers. Another reason for growth in these services is that they are simpler to deliver. Technology is more straightforward than it used to be — witness how people can create web sites or drive smart phones, for example. By the same token, the barrier to entry for hackers is lower. As a result the threat is growing. But isn’t it always? Am I just going to say “be vigilant” and then we all get on with our lives? Well, no, because there’s an additional factor which means this proliferation can no longer be ignored. It’s about the nature of the attack surface. In traditional computing models, we could consider this in three parts: first the physical environment; then the computer hardware; then the software. Policies, procedures and protections would be considered for each. In the virtual world, the physical and hardware layers have been architected to create a reasonably robust underlying platform. Yes, sure, this still needs protecting but to a large extent it already is — the controls are well known and straightforward to check. On top of this platform we — the global we, of corporations and providers — have created a massively scalable, massively interconnected but massively complex virtual compute environment. Here’s the point: even as it gets more complex and harder to protect, it is becoming simpler to hack and exploit. We can’t just stand by and hope it isn’t going to happen, because automation will ensure it will. What to do? There’s only one answer really, and that’s to get there first. Penetration testing (ethical hacking) has been around for years; indeed it used to be my job. And just as computers can be programmed, so can exploits — there are libraries of them freely available. We should not be daunted by kicking off such activities, of running a program of checks for back doors into our own systems. It’s not that hard to do — that’s the point. If it was, the bad guys would be looking for easier ways to make money. The many benefits ethical hacking offer organizations will certainly outweigh the bit of time and effort required to implement it. If you don’t want to do it yourself, you can engage an (ethical) service to do it for you. As we already know, there are plenty of them around. You don’t have to check all your IT systems and services, just the ones that give access onto the data you have that is worth protecting. Which raises a final point: If you don’t already know what data you have that is worth exploiting, for heaven’s sake work it out. Then check whether it is accessible. There will be a cost, but after all, it will be worth your while paying a relatively small sum up front, rather than shelling out to repair the damage later. The difference ten years can make can be profound. 1966 looked nothing like 1976, and in each decade since, almost everything has changed. The Internet and globalization has meant that cultural shifts are less stark these days, but in terms of cyber security, 2006 feels like a long time ago. This was a one year before the iPhone was launched, where 3G was just rolling out, and there was no such thing as apps. Streaming music, photo sharing, social networks were all in their infancy. In 2006, cyber security threats were very different to those today, as what was accessible to attackers was pretty limited. Now, every aspect of our lives is stored in the cloud – from our banking and health records to our more personal identities – and we are generating significantly more data than ever before. The type of threat has evolved to keep pace with this explosion in valuable data. Back in the early 2000s, most threats and malware were a nuisance, designed to simply disrupt or frustrate users. Then in 2008, the Zeus Trojan was unleashed, that grabbed banking details via key-logging and form grabbing. Years later, 100 people were arrested for having stolen over $70 million thanks to the software. This was the start of a much more professional approach to cyber-crime. Viruses, Trojans and worms started to be created to steal money or sensitive corporate information. Variants of the Zeus Trojan still plague computers to this day, and played a part in one of the biggest consumer hacks to date, that of Target in 2013. It is key to remember, that as soon as something connects to the Internet, it becomes vulnerable. As we add connectivity to new things, everyone involved should be aware of the risks. Take connected cars for example. In car Wi-Fi and streaming video entertainment systems are becoming big selling points, but as demonstrated last year, weak security can let intruders in. With such high profile breaches regularly hitting the news over the news, it has been interesting to witness how consumer attitudes have changed. Since 2013, there have been almost four billion records lost, and people are no longer shocked. At this scale, everyone from companies, to employees and everyday consumers now accepts that it’s a case of ‘when, not if’ they’ll be hacked. Yet all is not doom and gloom. We surveyed millennials’ opinions to data security recently, in our Connected Living 2025 report. Two thirds said they would feel vigilant in the face of threats, well ahead of complacent and paranoid. This suggests people now understand the importance of protecting their data. If the past ten years have taught anything, it is that perimeter defenses will be breached. No matter how tall or big the wall is, the enemy will find a way around it or under it. Despite the increasing number of data breaches, companies continue to rely on firewalls, threat monitoring and other breach prevention tools as the foundation of their security strategies. Yet most IT professionals readily admit that their corporate and customer data would not be safe if theirperimeter security defenses were compromised. This is not to say that perimeter security is not important. It just means that it should not be the only thing companies do to keep the bad guys out. Instead, IT professional should accept the fact that breaches are inevitable and work to secure the breach by placing security measures closer to the data and the users with encryption and multi-factor authentication. Two additional developments have also made the dents in the capabilities of cyber criminals. Multi-factor authentication has shown its power in keeping records safe, and encryption is also becoming the norm so if data is lost or stolen, it’s useless. Cyber security threats will continue to pose a significant problem. But as those born after the Internet hit the mainstream in 1995 approach adulthood, we’re well placed to face these threats head on. It’s a far cry from 2006, when 26.5 million U.S. military records were stolen, and the agency responsible waited three weeks to say anything to those affected. Security has always been a hot topic, but with hacks of companies likeTalkTalk generating headlines and companies collecting more and more data about us online, the issue of protecting data and securing consumer trust has never been higher.